One of Turkey's Unesco World Heritage Sites, the Göreme Open-Air Museum is an essential stop on any Cappadocian itinerary and deserves a two-hour visit. First an important Byzantine monastic settlement that housed some 20 monks, then a pilgrimage site from the 17th century, this splendid cluster of monastic Byzantine artistry with its rock-cut churches, chapels and monasteries is 1km uphill from Göreme's centre. 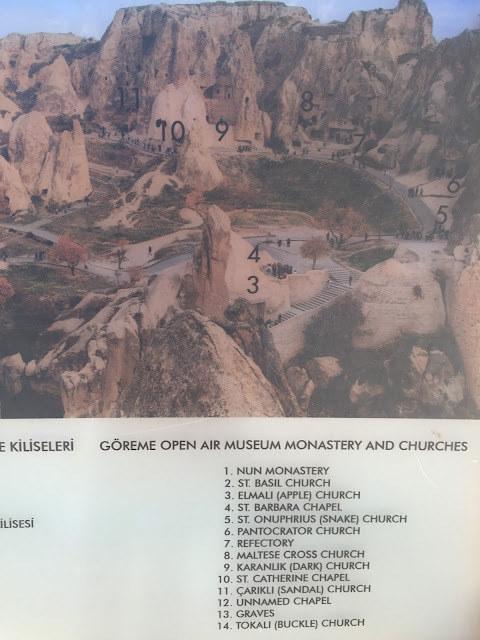 Note that the museum's highlight – the Karanlık Kilise – has an additional TL10 entrance fee. 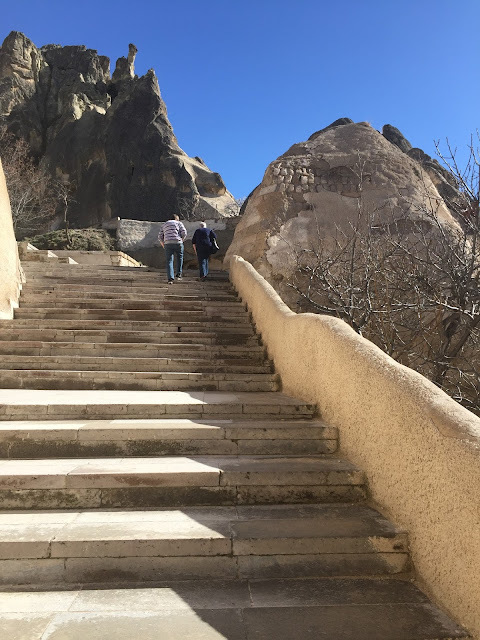 From the museum ticket booth, follow the cobbled path until you reach the Aziz Basil Şapeli , dedicated to Kayseri-born St Basil, one of Cappadocia's most important saints. In the main room, St Basil is pictured on the left; a Maltese cross is on the right, along with St George and St Theodore slaying a (faded) dragon, symbolising paganism. On the right of the apse, Mary holds baby Jesus with a cross in his halo. 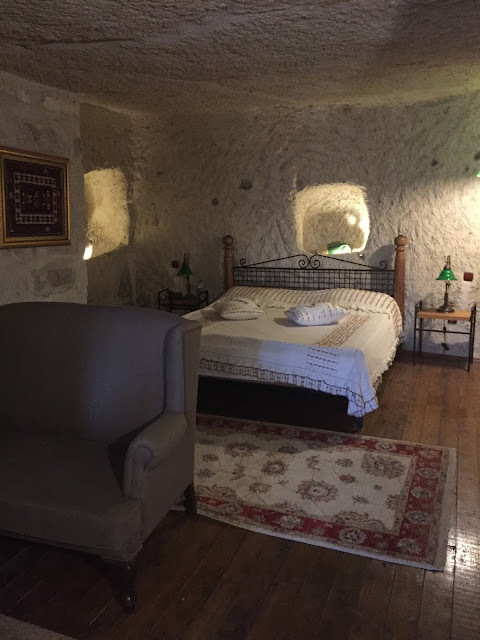 Just above, bow down to enter the 12th-century Elmalı Kilise , overlooking a valley of poplars. Relatively well preserved, it contains both simple, red-ochre daubs and professionally painted frescoes of biblical scenes. The Ascension is pictured above the door. 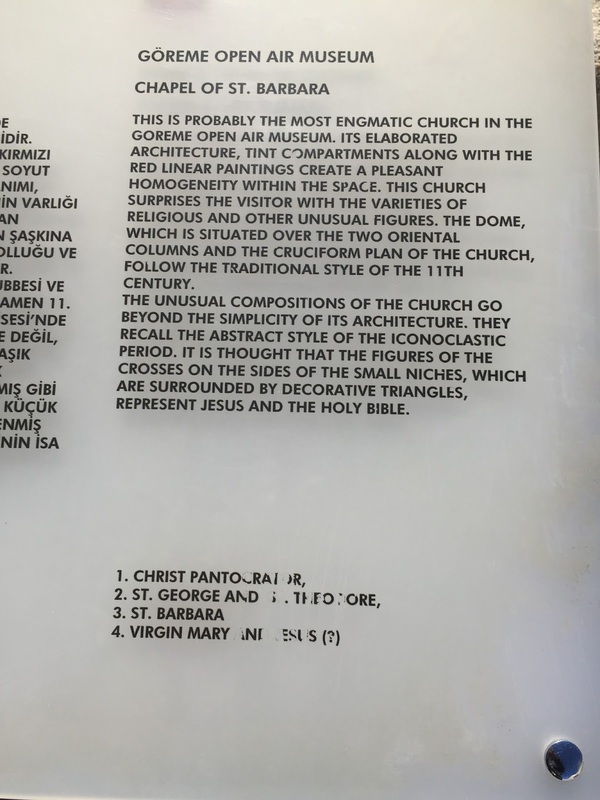 The church's name is thought to derive from an apple tree that grew nearby or from a misinterpretation of the globe held by the Archangel Gabriel, in the third dome. Byzantine soldiers carved the 11th-century Azize Barbara Şapeli , dedicated to their patron saint, who is depicted on the left as you enter. 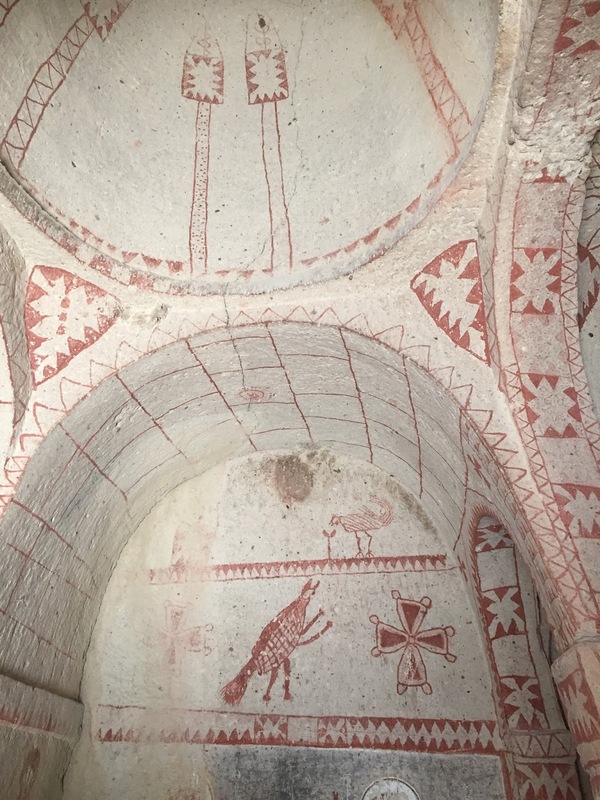 They also painted the mysterious red ochre scenes on the roof – the middle one could represent the Ascension; above the St George representation on the far wall, the strange creature could be a dragon, and the two crosses the beast's usual slayers. Uphill is the Yılanlı Kilise , also called the Church of St Onuphrius, where St George's ubiquitous dragon-foe is still having a bad day. To add insult to fatal injury, the church got its current moniker when locals mistook the pictured dragon for a snake. The hermetic hermaphrodite St Onuphrius is depicted on the right, holding a genitalia-covering palm leaf. 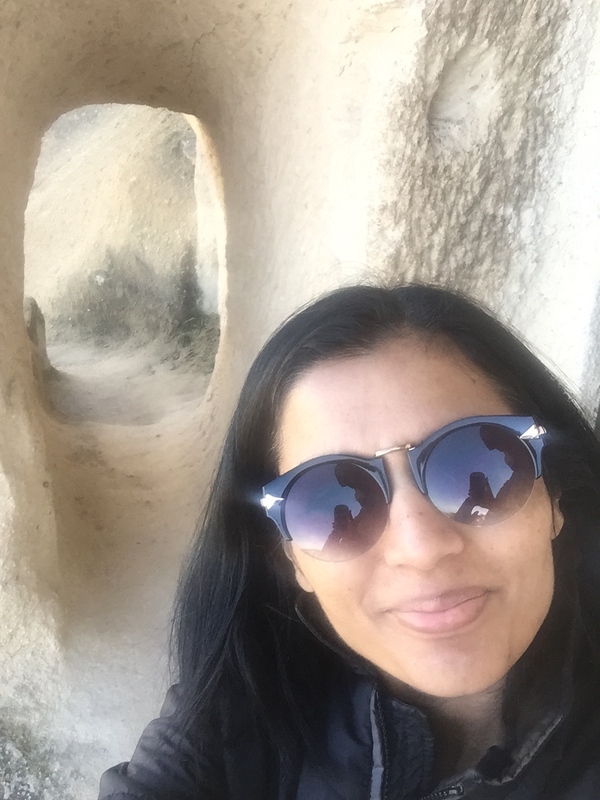 Straight ahead, the small figure next to Jesus is one of the church's financiers. 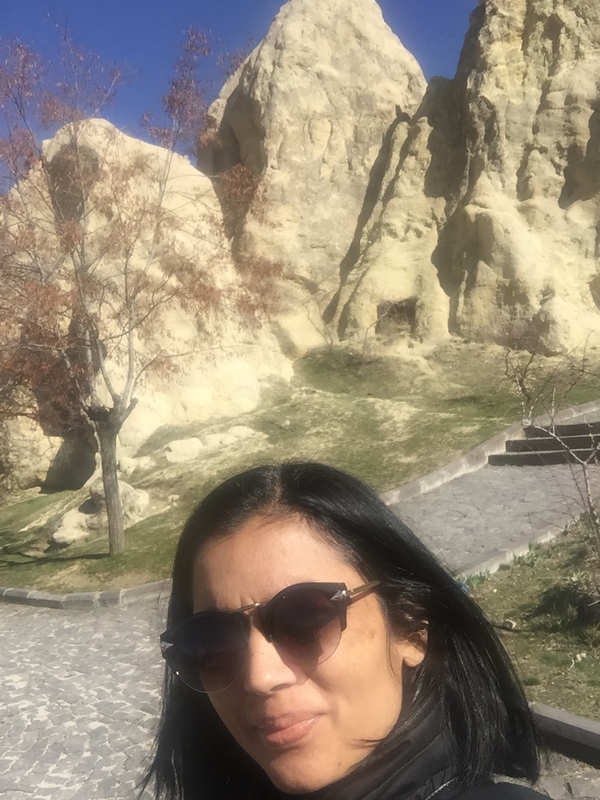 The stunning, fresco-filled Karanlık Kilise is the most famous of the Open-Air Museum's churches. It takes its name from the fact that it originally had very few windows. 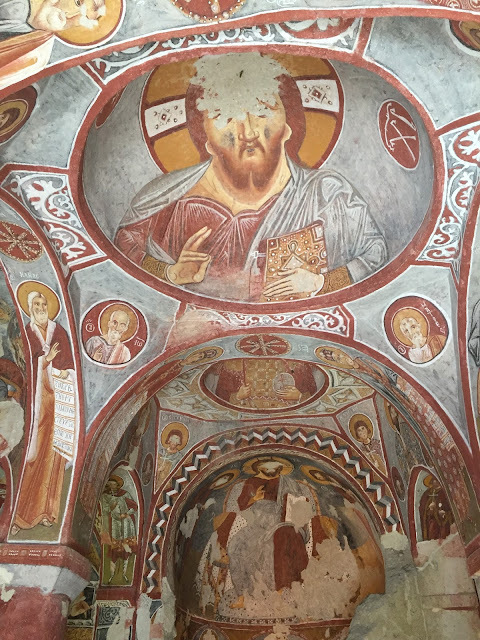 Luckily, this lack of light preserved the vivid colour of the frescoes, which show, among other things, Christ as Pantocrator, Christ on the cross and the Betrayal by Judas. The church was restored at great expense and the entrance fee is intended to limit visitor numbers to further preserve the frescoes. 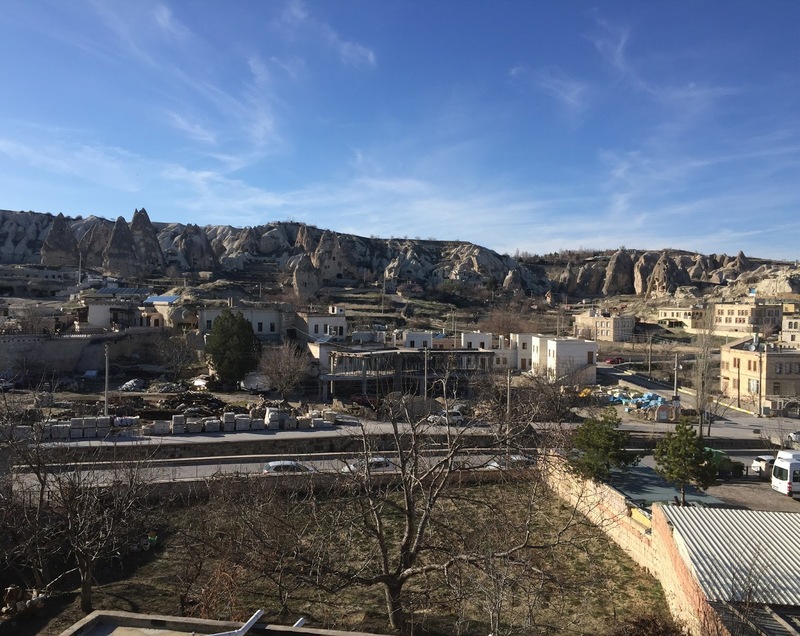 Just past the Karanlık Kilise, the small Azize Katarina Şapeli has frescoes of St George, St Catherine and the Deesis (a seated Christ flanked by the Virgin and John the Baptist). 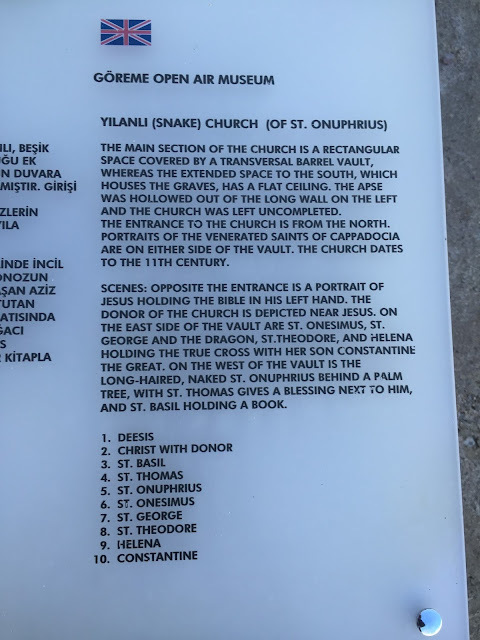 The 13th-century Çarıklı Kilise is named for the footprints marked in the floor, representing the last imprints left by Jesus before he ascended to heaven. The four gospel writers are depicted below the central dome; in the arch over the door to the left is the Betrayal by Judas. Downhill, the cordoned-off Rahibeler Manastırı was originally several storeys high; all that remain are a large plain dining hall and, up some steps, a small chapel with unremarkable frescoes. When you exit the Open-Air Museum, don't forget to cross the road to visit the Tokalı Kilise , 50m down the hill towards Göreme and covered by the same ticket. 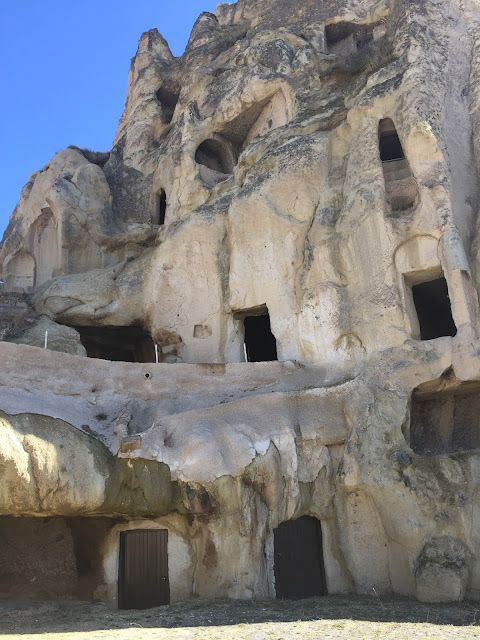 This is one of Göreme's biggest and finest churches, with an underground chapel and fabulous, recently restored frescoes painted in a narrative (rather than liturgical) cycle. 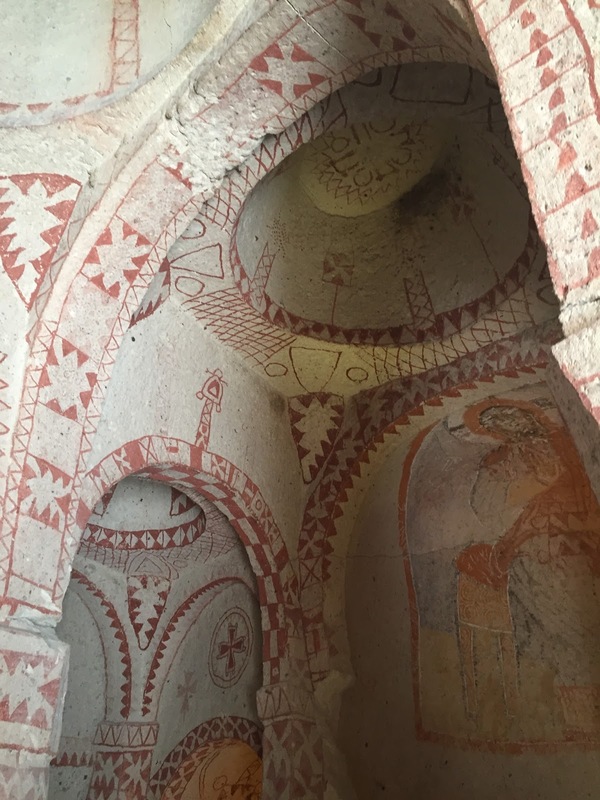 Entry is via the barrel-vaulted chamber of the 10th-century 'old' Tokalı Kilise, with frescoes portraying the life of Christ. Upstairs, the 'new' church, built less than a hundred years later, is also alive with frescoes on a similar theme. 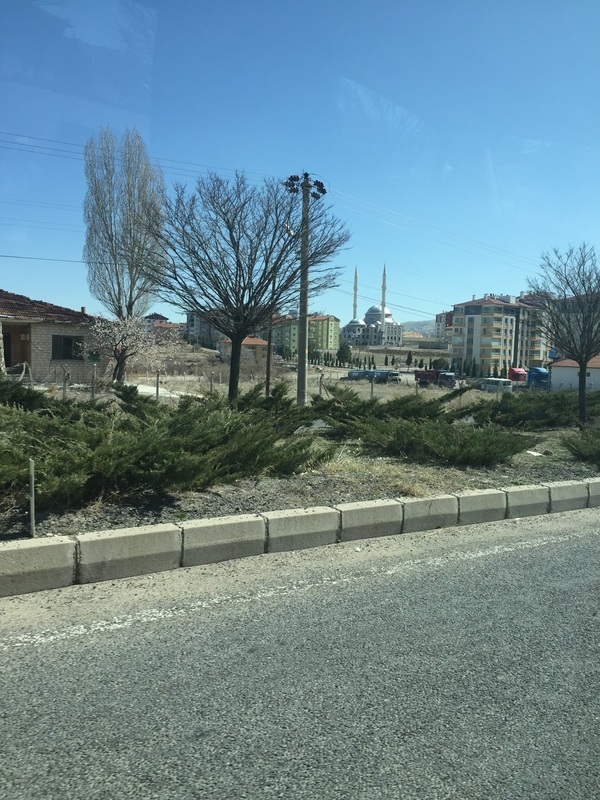 The holes in the floor once contained tombs, taken by departing Greek Christians during Turkey's population exchange.